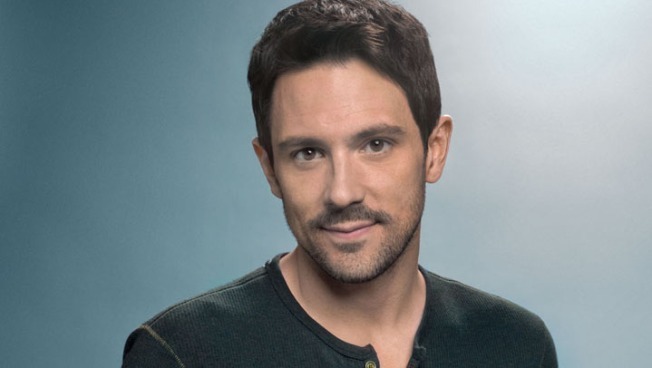 Kentucky-bred Steve Kazee is an Irish busker in "Once"
Broadway’s “Once” is a low-key romance set in Dublin’s pub scene. Guy, a vacuum cleaner repairman, meets Girl, a Czech emigree, busking on the streets. So intimate and universal is the story, the characters are never named. Conceived by singer-songwriters Glen Hansard and Marketa Irglova, “Once” began life as a 2007 movie. A sad, steady ballad from the film, “Falling Slowly,” won that year’s Oscar for Best Song. “Once” found a second life last year on stage with the New York Theater Workshop, and after a run in the East Village, it opened last month at the Bernard Jacobs Theater, with telegenic actors Steve Kazee and Cristin Milioti in the leads. NBC4NY caught up with Kazee (“Spamalot,” “110 in the Shade”), who explained why a city as receptive to the arts as New York is a tough place to be a street musician. NBC4NY: To prepare for “Once,” you drove cross-country from L.A., busking. KAZEE: Glen once told me that if you want to be strong enough to do these songs every night, go stand on the street and sing until you hear your voice bouncing back from the buildings. What I ended up finding was that putting yourself on a street corner in a random city, to play for people you don’t know, makes you feel incredibly exposed. NBC4NY: You stopped in Winslow, Ariz., because you thought it would be cool to play where “The Eagles” set “Take It Easy.” Where else did you go? KAZEE: I was in Nashville playing out in a park, and there was the sense that no one paid any attention. This was horribly humiliating. You feel like, “I must be terrible.” Everybody had headphones, and was looking at their iPods. People would either ignore you, or avoid you because they were afraid you wanted money. I wasn’t trying for that. NBC4NY: And then you got to New York and played on the subway? KAZEE: You would expect a city like New York to be accepting of the arts and street performers, but (the city) has a really sort of fascist attitude toward busking. If you don’t apply for a permit through the city, then you can’t do it. There’s the whole underground series where you register with the city, and I can’t help but feel it’s a way for New York City to try to get their part of whatever money you’re going to make as a street musician. NBC4NY: Buskers have it hard, and so do some actors — you’re carrying a guitar around your neck eight shows a week. KAZEE: I’ve got physical therapy at 3 p.m. today. NBC4NY: When you have a song like “Falling Slowly,” which everyone is waiting to hear, is there a risk you lose the passion in it by simply repeating it so many times? NBC4NY: “Once” is set in Dublin. You’re from Kentucky and have never been to Ireland. KAZEE: The Irish folk we’ve had come see the show always say “Come over, stay with my cousin.” It takes a little pressure off you. I didn’t want to be doing the “Always after me Lucky Charms” kind of acting.